As we approach the 60th anniversary of the end of the Second World War, there is one piece of unfinished business as far as Leigh is concerned. Morgan Witzel’s book tells how on 30 September 1940 a German ME109 fighter, which had been escorting a large Germany bomber force, was shot down. It landed in flames in the garden of Kennards , between the pond and the driveway down to the house. As always in these cases, children – young boys in particular – were soon on the scene looking for trophies and in due course Special Constables – of whom there were over twenty in Leigh – and Leigh’s own Fire Brigade arrived. The pilot was Corporal Kurt Hubel, an experienced flyer and he was dead – shot in the original air battle. However, Leading Fireman, Fred Faircloth and his team were able to retrieve the body and it was taken up to the Churchyard – it is said – in a wheelbarrow. The next day, Corporal Hubel was buried – we think by the Vicar, Mr Sealy, although we have not found details of the service. We do know, however, that over the coming months a number of school girls put wild flowers on the grave because they felt he was just another fellow human being. After the War, the British government got in touch with the families of all the dead Luftwaffe pilots buried in the UK and suggested three options to them. First, they could leave the body where it was: apparently few families took this option. Secondly, the body could be sent back to Germany. 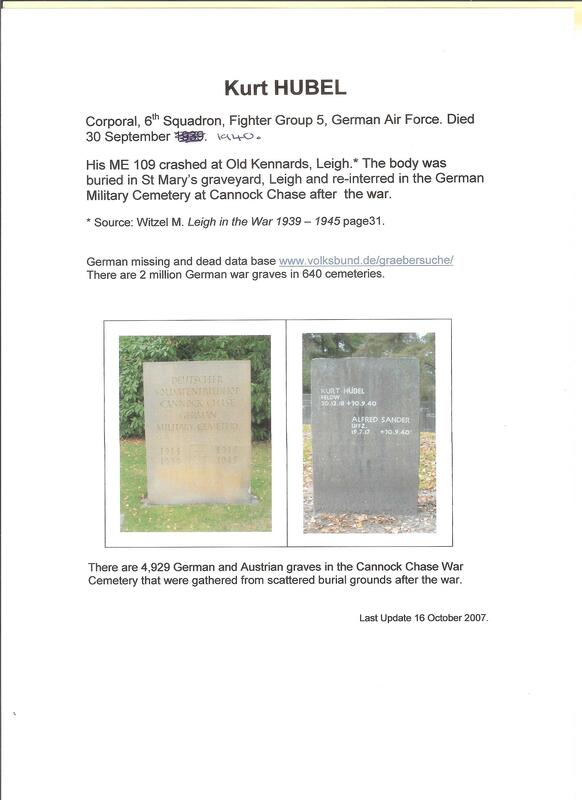 And thirdly, the body could be exhumed and buried in a special War Cemetery in Cannock Chase with many other Luftwaffe men on what was declared to be German soil. The family of Corporal Hubel chose the third option and in 1961 or 1962 the body was exhumed and formally buried in Cannock Chase. So on Remembrance Day as we think about the people from Leigh who lost their lives in the War, think too about the efforts made by the village to try to overcome the bitterness of conflict and of the lost relatives of Corporal Hubel – our then enemy – whom we would like to help. 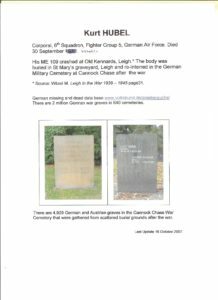 After last month’s article (in November 2005) about Corporal Kurt Hubel, the dead German pilot, whose plane crashed at Kennards in September 1940, there was a surprising outcome. I received a phone call from Joe and Jill Kaye who now live at Kennards. They had someone coming to dig on the site who was an expert on old crashed planes and who had helped on the original excavation. His name was Steve Izzard and he lived in Tonbridge. We have now talked with him and he knows a good deal of the post war story. What is more, however, Steve Izzard had been in touch with Corporal Hubel’s nephew – who is a businessman in Hamburg. At the time of going to press Steve is trying to contact him to tell him the story of the Iron Cross which has been rediscovered. Kurt Hubel, German pilot died 30 September 1940. The German missing and dead database is www.volksbund.de/graebersuche.